Japanese manufacturer of car cabling systems Yazaki will build a third plant in Bulgaria, according to Sinan Kar, General Manager of Yazaki Bulgaria. Kar told Capital Daily that the new plant of the company would be located in the central part of the country, adding that the exact location of the unit was yet to be selected. He noted that the investment in the new plant amounted to EUR 30 M, including construction and installation work and equipment. The General Manager of Yazaki Bulgaria informed that the investment was to be made over the next two years. He said that the company was considering several options for the site of its new unit, stressing that it had to be outside Sliven or Yambol, where the other two plants of the company were located, because the labor force resources of these regions had been exhausted. Kar said that the third plant of the company in Bulgaria would be related to the launch of a new project related to a new client. He noted, however, that the structure of the new plant would be identical to the existing ones. Yazaki Bulgaria has so far invested EUR 60 M in Bulgaria. The Japanese company set foot in Bulgaria in 2006. 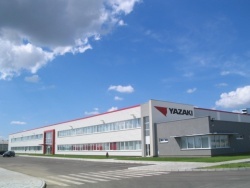 The Yambol-based plant of Yazaki Bulgaria, the first one to start functioning, manufactures cabling systems for Renault and Ford and has a staff of around 3700. In 2012 the company opened a plant in Sliven. The Sliven-based plant of Yazaki Bulgaria manufactures wiring systems for Ford Transit and has a staff of 1300.